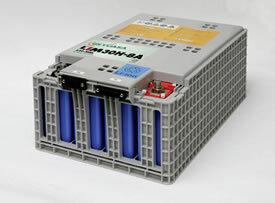 March 15, 2011, Kyoto, Japan: GS Yuasa’s LIM30H-8A lithium-ion battery module has been selected by the Kinki Sharyo Co., Ltd. for the company’s next generation LRV, the ameriTRAM™. ameriTRAM™ is a 100% low-floor LRV designed specifically for the US market. ameriTRAM™ is able to operate in locations where external electric power is not always available. Energy stored in the onboard Li-ion batteries is used to power the traction system and all auxiliary loads in parts of the track where an overhead catenary is not available. When external power is available, it is used for all onboard loads and to recharge the batteries as needed. The batteries also store regenerative braking energy for reuse. 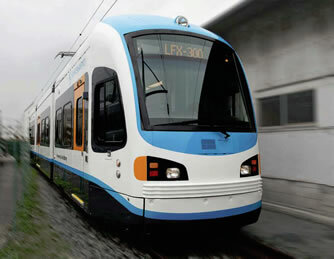 Vehicle testing began in May 2010 at Kinki Sharyo’s test track in Osaka, Japan. Demonstrations in the US are under way. The ameriTRAM™ battery system is based on GS Yuasa’s existing LIM30H-8A lithium-ion battery module and was jointly developed by GS Yuasa and Kinki Sharyo. The union of GS Yuasa’s proven high performance and high power lithium-ion batteries and Kinki Sharyo’s latest LRV technologies enables operators to meet energy usage goals and provides uncommon value. GS YUASA manufactures large format lithium-ion cells for aviation, space, electric vehicle (EV) and hybrid electric vehicle (HEV) applications. GS Yuasa also manufactures large format lithium-ion cells, modules and battery management electronics (BME) for industrial automated guided vehicles (AGVs), railway way-side energy storage systems, and industrial hybrid applications such as rail switchers and rubber tire gantry cranes (RTGCs). Functionality includes: individual cell voltage monitoring, cell balancing, module temperature measurement, state of health, and data communication.